Make video calls with family and friends with high quality picture and sound through the built-in HD camera and the two microphones.Also the subtle brushed pattern provides a sophisticated finish, accentuating the premium aluminum cover. 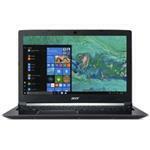 The Acer Aspire 7 is a 15.6 inch laptop that retains your holiday pictures and wedding photos in Adobe Premiere Pro and in your free time you play games at high settings. Your programs and games start in a few seconds through the SSD. movies and games come true to the Full HD IPS screen with wide viewing angle. For example, friends are watching a movie without the colors appearing or the image distorted.